"Just Sardinia, Just Corsica, Just Sicily and CarhireXS.com have teamed up to offer Car Hire Excess insurance. 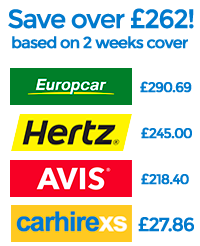 From as little as £1.88 per day or £39.99 for an annual policy, CarhireXS.com can now cover the excess on your car hire whilst abroad." Authorised & Regulated by the F.C.A. Whenever a vehicle is hired the renter pays for supplementary insurance which provides cover in the event of an accident or theft of the rented vehicle or damage to another individuals person or property. Typically car hire insurance from a rental company comes with an excess and in the case shown here, for a two week rental in Europe, the client is liable for the first £1,496 pounds of any claim if the vehicle is stolen and the first £792 of any claim if the vehicle is damaged in any way. This explains why your credit card is swiped when you hire a vehicle, as its to ensure that you have sufficient funds available too cover potential excess exposure. The comprehensive single trip and annual multi trip car hire excess waiver insurance featured on our site covers the policyholder by reducing these excess costs to zero on insurable events that may occur during the rental period. In addition it covers the insured for extra incidents such as misfueling, loss of keys. medical emergencies, baggage cover etc. This cover also insures items normally excluded from the car hire companies insurance including such items as windscreens or windows, roof, tyres and the under body. Now you can purchase extra top insurance ( excuding personal injury cover)from the car hire rental company but as in the example here, you can see that you are looking at an additional £20.76 a day which for a two week rental amounts to an extra £290.67 Compare that to our cover which comes in at a flat £1.88 a day for rentals in Europe and £2.40 for rentals in destinations further afield. Thats only £26.32 for two weeks cover in Europe and a saving of over £260.00!